Drs. 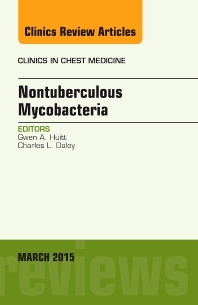 Huitt and Daley have assembled an expert panel of authors on the topic of Non-Tuberculosis Mycobacteria. Articles in this issue will include discussions in the following areas: The Pathogenesis of NTM, Epidemiology of NTM, Environmental Sources of NTM, Laboratory Diagnosis of NTM, Medications and Monitoring in NTM infections, Treatment of Rapidly Growing NTM, Treatment of Slow Growing NTM, NTM Infections in Immunocompromised Hosts, Extra Pulmonary NTM Infections, NTM Infections in Cystic Fibrosis, and Surgical Approach to NTM Infections.